I met up with the lovely Kathy of the eponymous Kathy YL Chan blog while she was here in London for a visit. Knowing her penchant for desserts, we first met at Maltby Street for St John’s famous custard doughnuts before wandering over to Borough Market in search of something savoury. Somewhere in between the two markets, after much discussing, a booking was made for afternoon tea at William Curley (the patissier-chocolatier) in Belgravia. On weekends, and it was a Saturday when we met, they open up their Dessert Bar and offer a dessert tasting menu for the afternoon. On all other days, they still sell their delicious chocolates, cakes and ice creams. 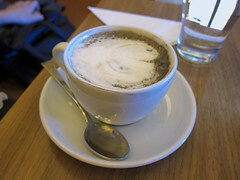 When we got there later that day, we settled into our table (the seats at the six-seater bar had already been booked up) and ordered a hojicha latte (Kathy) and a house blend tea (me) to get us in the mood for the desserts. We chose to share one menu between the two of us, which turned out to be just the right amount of dessert for two girls who’d previously been feasting on doughnuts and pork pie. 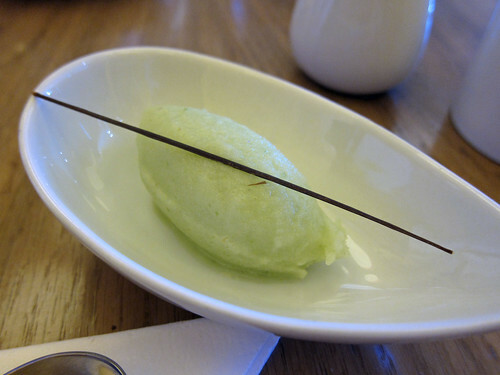 We started with a quenelle of Green Apple Sorbet, all tart and just slightly sweet in a good way! It was immensely refreshing. 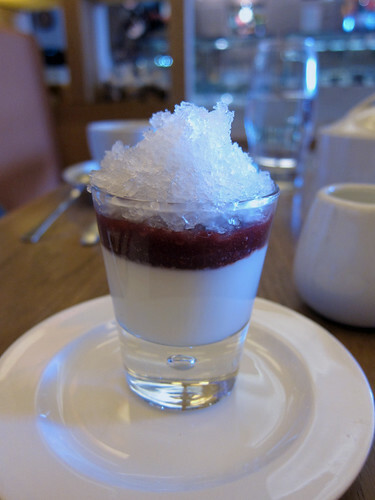 Next up was a Vanilla Pannacotta with Red Berry Compote and Champagne Granita. The pannacotta was very softly set, making it more like a pudding with the zingy compote and yes, straight up champagne ice. A very adult dessert. 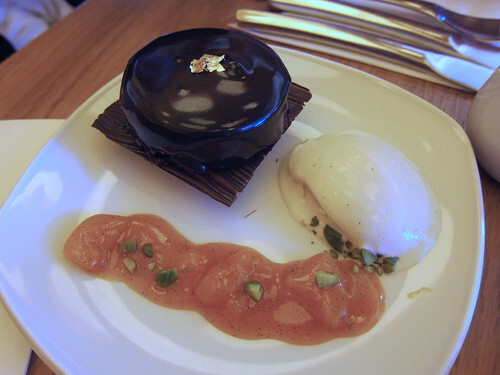 That was followed by an Apricot, Pistachio and Chocolate Pave with Marinated Apricots and Lemon Thyme Ice Cream. I loved the use of the seasonal fruit and the entire combination was delicious, especially that ice cream. Our final main dessert was a generously portioned Passionfruit Tart and Mango Casket with Passionfruit Sauce and Guava Sorbet. That tart was delicious as was the casket filled with a mango fruit, mousse and cake and with a heart of chocolate ganache. I knew Curley was well known for the incorporation of Asian flavours into his chocolates and this was a good example of this. A selection of Petit Fours finished off our afternoon dessert tea. 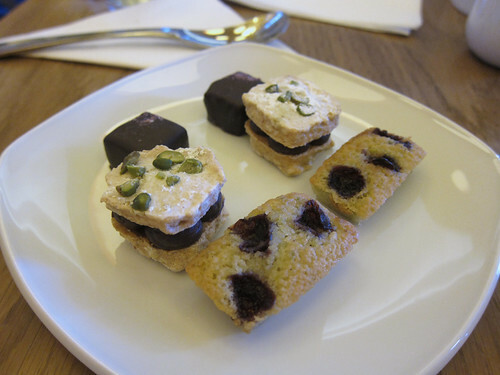 All the bites were just perfect: a blackcurrant and juniper chocolate, a pistachio dacquoise sandwiching chocolate cream, and raspberry financiers. The quality of the desserts was excellent and it’s not a bad deal at £15 for the dessert tasting menu we shared (drinks not included)! It’s obviously not your traditional afternoon tea but it’s a fantastic alternative. William Curley’s original shop is in Richmond and while there are cakes available to purchase there (along with his chocolates and ice creams), there’s no dessert bar there. Do take a look at Kathy’s post on the rest of that Saturday! Wait, are you saying that you’d get that just for yourself? Did you order the petit fours separately? That looks like a perfect selection of desserts to me! You’re right – I should have been clearer. The tasting menu consisted of: sorbet, pannacotta, apricot and chocolate pave, passionfruit tart and mango casket AND the petit fours! All of that for £15. And I believe the selection changes each week. £15 is a real bargain! And they look delicious, also can’t believe that was for one person……the Apricot, Pistachio and Chocolate Pav looks so good, so shiny. I know! 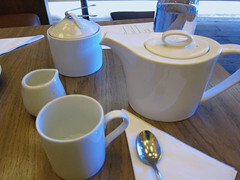 For such quality too – and it’s cheaper than most hotel afternoon teas. Looks fantastic! Never heard of William Curley or hojitcha latte until now. Oh those custard donuts are well worth the long trek around anonymous looking streets! Anonymous looking streets is right! That looks amazing. Perfect for sharing too! Absolutely perfect. I’m not sure whether I would have been able to handle all that by myself! They were gorgeous. Love petit fours when they put care into them. William Curley makes very interesting chocolates…I’m keen to try more. Isn’t it fab? Well worth a visit! Looking at those desserts I think I have just been converted from savoury to sweet. The presentation is fantastic. Take care of yourself over there! And yes, next time, your side of the pond! We Love W.C. really glad I stumbled on it while being stuck a Victoria, We have been back several times.We Must try the £15 dessert bar. I thought the ice cream had great flavours, but was not the best ice cream ever, good enough though. Everything else was beautiful. 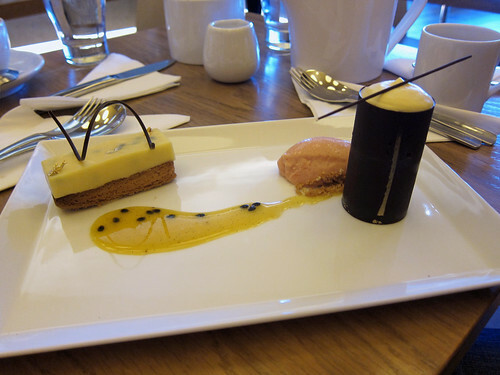 The use of Amedi chocolate in the chocolates, the deserts we had all superb. No wonder it has won the awards it has won.